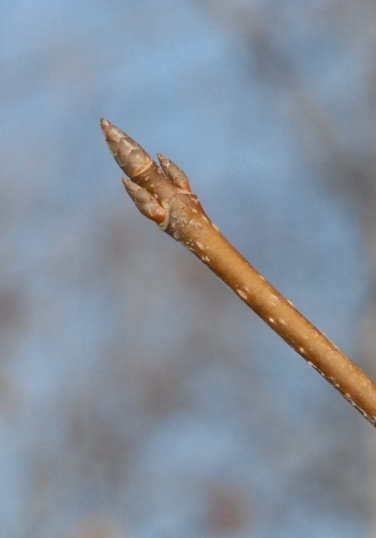 Late winter and early spring is maple season; that time of year when maple producers in Ohio and other parts of northeastern North America tap maple trees to collect sap. This sap is boiled down to produce maple syrup, or further processed into maple sugar, fudge, nougat, cream or other products. Maple syrup production is unique to North America and specifically the area between Minnesota in the west, Kentucky in the south and the eastern Canadian providences in the north. If you have access to a few maple trees, whether growing in your yard or in a woodland, you can produce your own maple syrup and perhaps even have enough to use as gifts for family or friends. It’s easy, great fun and a very educational family activity. Making maple syrup requires boiling the sap until the sugar content of the sap reaches a desired level. While sap can be collected from any maple species, sugar and black maple are preferred since the sugar content of their sap is higher than other maple species. Starting with a higher sugar content sap requires less time and energy to produce a desired product. This doesn’t mean red and silver maples can’t be tapped for syrup. Good syrup can be made from red or silver maple, but it is more likely to be cloudy and the tapping season may be shorter. “Maple” syrup can also be made from the sap of boxelder, which technically is a maple (it belongs to the maple genus), but boxelder sap should not normally be combined with sap from other maples. Boxelder syrup can have a heavy, almost sorghum-like flavor that may be perceived as somewhat bitter compared to syrup made from other maples. Good boxelder syrup, however, is quite palatable, and is produced and marketed in parts of North America where other maples are not common. Figure 1. 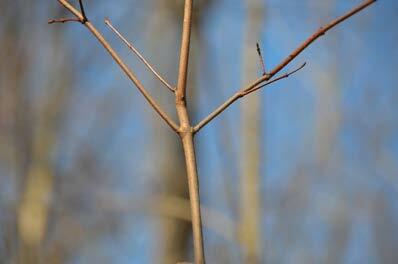 Opposite branching of sugar maple. Before you start tapping trees, you need to be sure the tree you want to tap is actually a maple. Many a hobbyist has been frustrated with their sap collection endeavors only to learn they have tapped an oak or hickory. How can you tell the difference? 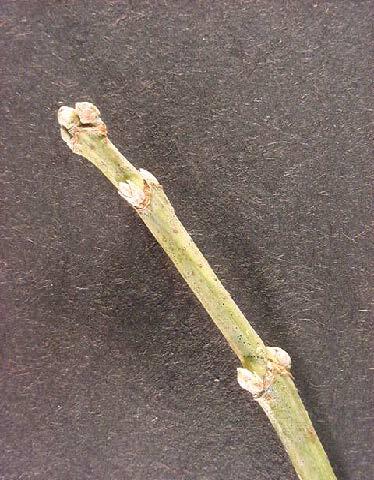 The maples belong to a small category of deciduous trees that are “opposite”–opposite branching, leaves attached and buds are opposite (Figure 1). To identify your trees, start when the leaves are on the tree as it is a much easier. 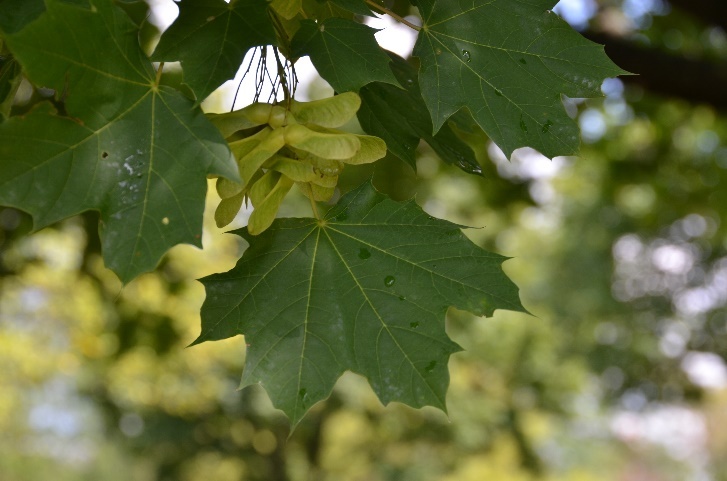 Below is a synopsis of characteristics for each of the native maples found in Ohio. Use for syrup: Black maple has a sap sugar content similar to sugar maple. Black maples are not as prevalent in Ohio as sugar maple. Figure 2. 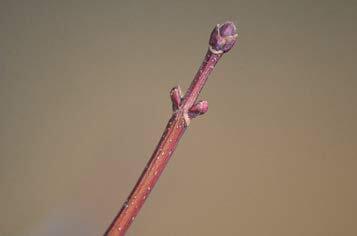 Black maple bud and leaf. Use for syrup: Produces a sorghum-like syrup. Figure 3. Boxelder leaf and bud. Use for syrup: The downside to using red maple is its sap sugar content is usually between 1.5 to 2 percent. This means it takes more gallons of sap, more fuel and a longer time frame to boil this down to a gallon of syrup. Figure 4. Red maple leaf and bud. 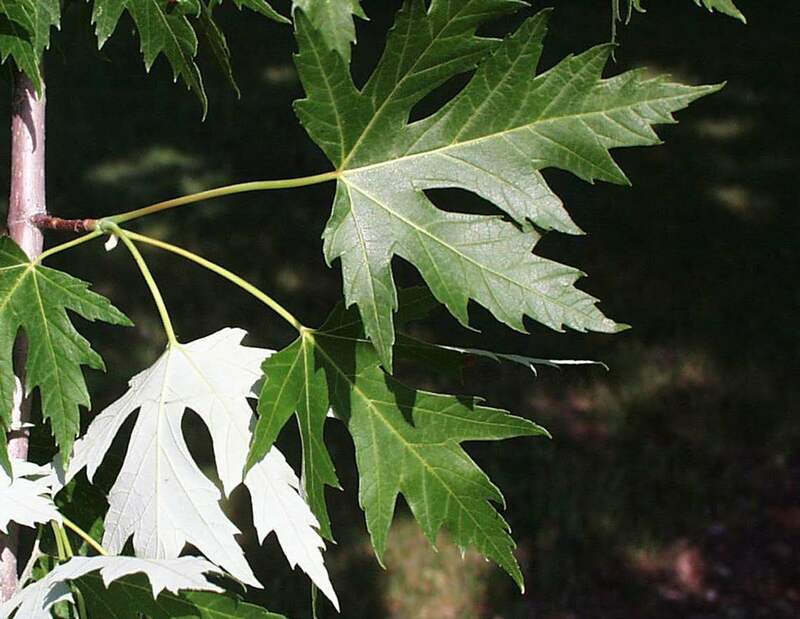 Use for syrup: Silver maple is used to produce syrup but similar to red it can be one of the first trees to start to bud out in the spring, which shortens the syrup season for the tree. Figure 5. Silver maple leaf and bud. Use for syrup: Sugar maple is the preferred tree to tap for maple syrup. The sugar content of the sap can run 2 percent or higher. Figure 6. Sugar maple leaf and bud. 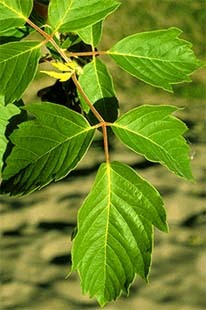 Habitat: typically a yard/landscape tree; moist but well-drained site. 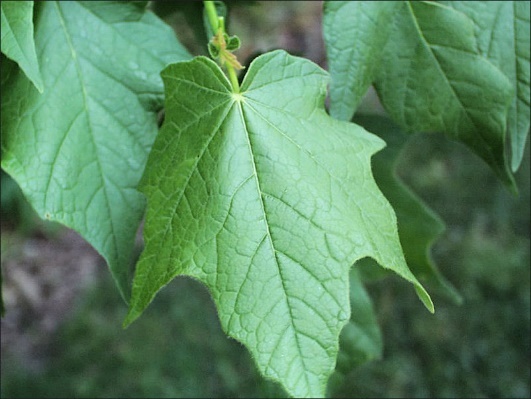 A non-native maple that is considered invasive in some states. Crimson King is a burgundy colored leaf variety of Norway maple. Use for syrup: Many report that sap is similar in sugar content to sugar and black maples. Figure 7. 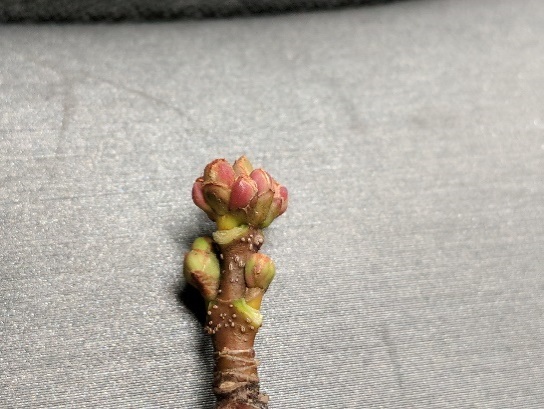 Norway maple leaf and bud. All of these maple species can be used to produce syrup. With sugar maple, it takes about 43 gallons of sap to produce 1 gallon of syrup. The lower the sugar content of the sap, the more gallons of sap that are needed to produce a gallon of syrup. Also, the lower the sugar content, the more fuel and time it will take to boil down the sap. Today, commercial producers can use technology to shorten this boil time. A reverse osmosis machine removes 75 percent of the sap’s water content before the boiling process even starts. The new tapping guidelines developed at the University of Vermont Proctor Research Center are to use one tap for trees 10 to 12 inches in diameter, two taps for trees greater than 24 inches in diameter, but no more than two taps per tree. Consider these rates for vigorously growing trees. Use reduced rates for trees that are not in excellent health. Figure 8. Use food grade containers only. Once you have explored your yard and identified all the potential trees to tap, the next step is to assemble the equipment that you will need to launch your backyard maple adventure. If you are only tapping a few trees, this is not a big deal and for the most part the equipment you will need is readily available. However, there are a few rules that you need to follow if you are going to be successful in producing a jar of one of nature’s sweetest treasures. First and foremost, you are producing a food product that you and your family will be eating and enjoying. That means you need to be as careful about producing your syrup. You need to use proper sanitation, process the sap as quickly as possible, and the equipment you use should be food grade. 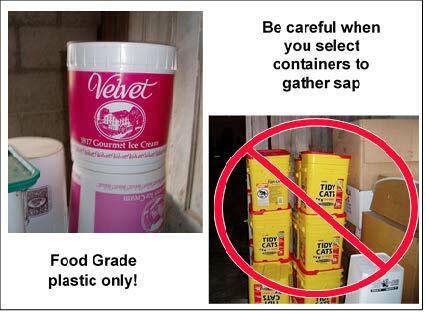 This means your gathering and collection containers are made of material that can be used to store a food product. No oil or chemical containers should be used. Avoid using containers that are made of reprocessed plastic because you do not know what they were used for in their previous life (Figure 8). Also, be aware that maple syrup can absorb the flavor of a container that was used to hold products like pickles and spaghetti sauce. Sap can also pick up the flavor of sanitizers. Do not use detergents, heavy chlorine cleaners or other soap products to wash out or sanitize your equipment. The best way to sanitize equipment is to use only hot water and elbow grease. You may already have some of the items needed for this endeavor on hand, or you can buy them at a local store. 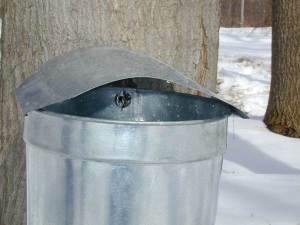 Others—such as metal and plastic collecting spouts (called spiles), a hydrometer, collecting buckets or bags and finishing filters—are unique to maple production (Table 1). Depending on the item, it might be made, purchased second hand from a maple producer, or purchased from a maple equipment supplier. 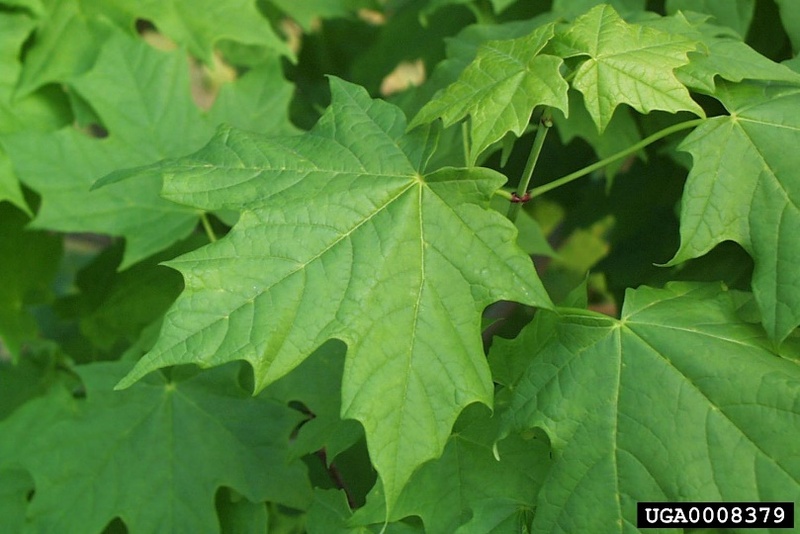 Check with your county Ohio State University Extension office, ODNR Division of Forestry Service Forestry office, or a local maple producer for the names of suppliers. Table 1: List of Equipment Needed. Sap flow occurs during the dormant season (leaves off), when nighttime temperatures are below freezing and are followed by days when there is a rapid warming above freezing (ideally to about 40 degrees Fahrenheit). The sap with higher sugar content usually occurs in the spring and therefore most tapping is done in late winter to early spring. Some producers tap by the calendar, routinely tapping each year on or before a certain date such as President’s Day. Others watch the weather for predicted suitable conditions. 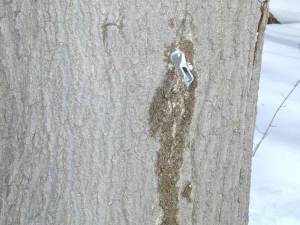 Sap flow from a tapped tree will not occur every day throughout the tapping season, but only when conditions are right. To get the sap from the tree you will need a spout (Figure 9). You will want to buy a new 5/16 spout made of metal or plastic. The smaller diameter will allow the tap hole to quickly heal over allowing the wound to heal when the spout is removed. If you decide to use plastic, make sure it is sturdy enough to support a bucket or bag that is full of sap (around 20 pounds). If you are going to place a bucket on the ground below the spout, you can buy a tubing spout and a short length of maple tubing to run from the spout to the bucket. The drill bit you select should be the same diameter as the spout. In most cases, this will be 5/16. Do not oversize or undersize drill bit because it may cause the tap hole to leak sap. You can buy a maple tapping bit for less than $20.00 and it will last you a lifetime. It is sized correctly and is designed to drill straight and clean out the hole. Figure 9. Types of spouts. The sap-collecting bucket should be made of plastic, aluminum or stainless steel (Figure 10). Old tin buckets should not be used because they contain lead. Many hobby producers find it convenient and more economical to buy plastic bags from a maple equipment supplier. Some of the bags can be washed out and reused but if sap spoils in them, they need to be discarded. The cost is minimal and they are really easy to use. Bags are held in place by a bag clip that has a hole to go over the spout and hold it in place. You can watch them fill up as the sap runs and you do not need a cover. If you use buckets, consider purchasing a cover to keep the rain out. Many maple equipment suppliers have put together a beginner’s kit that includes everything you need to tap a maple tree. Figure 10. 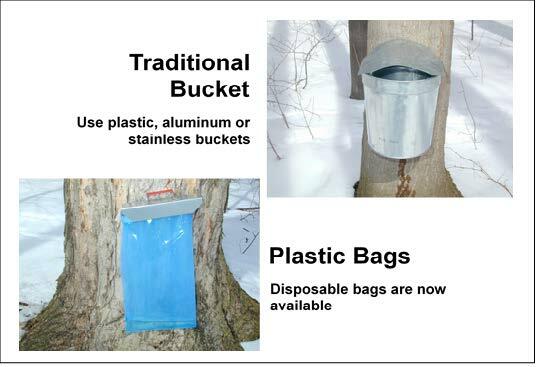 Buckets or plastic bags for collecting sap. When you walk up to the tree, the first thing you need to do is determine the diameter of the tree and its overall general health. You want to make sure that it is at least 10 inches in diameter. The best way to determine this is to measure a piece of rope to 33 inches long. Place the rope around the tree, and if the ends do not touch, then you have a tree that is at least 10 inches in diameter. If the ends overlap, the tree is too small and should not be tapped. 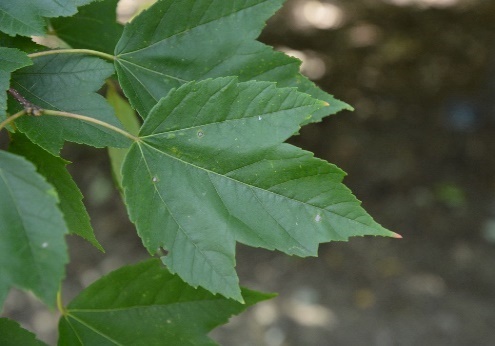 A healthy maple will have a large crown with very little damage to the branches. The bark will look healthy, with no dead wood showing. In the process of tapping, you will kill a small area of wood around the tap hole. This shows up as stained wood when a tree is cut down and a cross section of the base is examined. 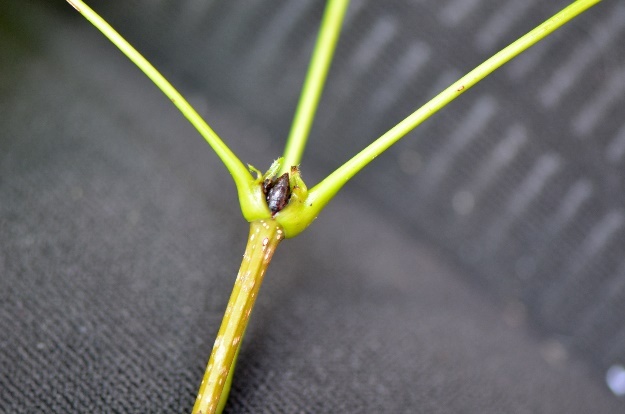 If a tree is tapped properly, there will be areas of new growth around the stained areas. Tapping is not detrimental to the tree but you need to make sure these areas of dead wood are not on top of each other. This happens when you tap at the same height or on the same side of the tree every year. Do not believe the old wives tale that you need to tap on the sunny south side of the tree to get more sap. Always place your taps staggered evenly around the tree over successive years by tapping both high and low. Figure 11. Drilled tap hole. Diagram courtesy of Randall B. Heiligmann. The next step is to drill the hole (Figure 11). Using your cordless or hand drill (with the bit sized for the size spile you are using) push the drill into the tree between 1.5 to 2 inches in depth. If you have to push hard on the drill, then the bit is dull and you need to find a new one. Keep the drill steady to prevent drilling an oblong hole that will leak. As you pull the drill from the hole keep it running to clean out all of the shavings. Never blow into the hole to clean it out as you will introduce bacteria from your mouth. You want to keep the tap hole open for at least three to four weeks before it heals. If you are drilling a lot of holes, it is a good idea to mark your drill at the 2-inch mark so you do not over drill the tree. Many times, old maples will be hollow inside and you do not want to hit one of those areas by drilling too deep. Now it is time to examine the shavings. They should be the color of new wood, an off white. If they are brown in color you have hit some dead wood. If this happens then you should wait to see if the tap runs. If, after 24 hours, nothing comes out, re-tap in another location. If you tap early and the tap dries up mid-season, never re-tap a tree to get more sap. This is why you really need to watch your local weather patterns before tapping. The next step is to place the tap and set the collection bucket or bag (Figure 12). Push the spout into the hole until it is snug, and then use a light hammer or a rubber mallet to set the spout with a gentle tap. Do not use a big hammer and over drive the spout or you may crack the hole on the top and the bottom causing it to leak sap. 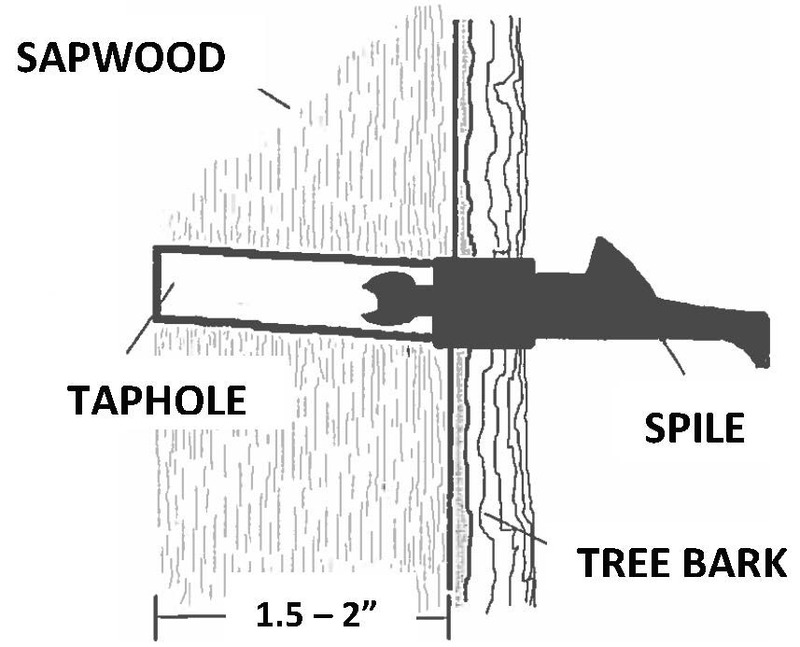 Some tap holes will naturally leak sap and show dampness around the hole (Figure 13). These spouts may need to be driven in a little more at a later time. This happens a lot if the wood is still frozen at tapping time. You will know if you have done a good job after the first windy day. Your taps will not be leaking and all of your buckets will be hanging where you put them. Place a cover over the bucket to keep rain out. If your area has slope, you can tie several trees together with a mini tubing system into a larger container. You can set up a dump station that you can empty your containers into then pump sap out from there. The only thing that limits your ability to collect sap is the limits of your imagination. Figure 12. Bucket with cover. Figure 13. Leaking spout. Because sap flow depends on weather, it is not always consistent. Some days no sap will flow; other days, as much as a quart to a gallon or more of sap may flow during a flow period (several hours to a day or more). During the season, an average tap will produce 6 to 10 gallons of sap. Slightly more than 10 gallons of 2 percent sugar-content sap are required to produce 1 quart of syrup. To empty or gather the sap from the containers hanging on the tree you will need a couple of clean 5-gallon food grade buckets. When it is time to collect sap, you can do this by hand or use a cart, wagon or an ATV to move the buckets full of sap to the site where you will be boiling. During a good run, expect around 2 to 3 gallons of sap per tap. Although not absolutely necessary, it is often desirable to filter sap through a cloth filter before it is boiled. This filtering removes any debris, such as twigs or pieces of leaves or bark, which might have fallen into the sap. 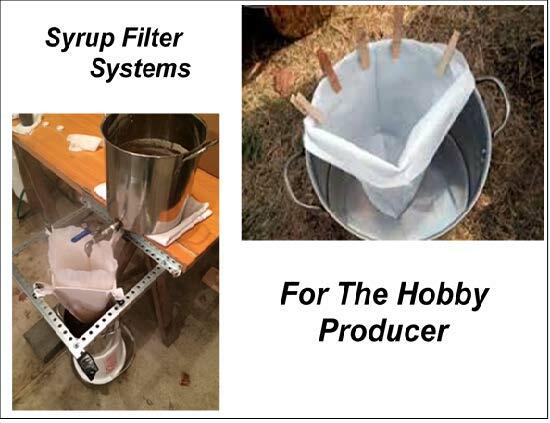 Several layers of cheesecloth will serve as a filter or a reusable (cleanable) maple sap filter can be purchased. To produce high-quality syrup, sap should be collected as quickly as possible. Keep in mind that if the sap warms up, bacteria will colonize and grow. The bacteria will interact with the sugar in the sap, and once heated, the syrup will turn dark. You will need to boil your sap as soon as possible, especially in warm weather. During periods of cold temperature, sap can often be stored for a couple of days under the proper storage conditions without seriously reducing the quality of syrup it will produce. If you store your sap in a tank, it should be in a shady location (perhaps on the shaded side of your house). Place mounds of snow around the tank to keep it cool. In warmer weather, you can add blocks of ice to cool the sap. These can be made from water or they can be made of frozen sap. Old chest freezers work well to store containers of sap, and they make a great place to store equipment in the off season. Sap is made into syrup by boiling off water, which increases the sugar content to 66 percent and causes chemical changes that result in maple syrup’s amber color and signature flavor. The amount of sap required to produce a gallon of syrup depends on the sugar content of the sap. In Ohio, sap averages about 2 percent sugar content, requiring 43 to 50 gallons of sap to produce a gallon of finished syrup. If the sap sugar content is higher (it varies from tree to tree, with weather, and other factors), less sap will be needed to make a gallon of syrup; if lower, more sap will be required. Most large commercial producers use a continuous feed evaporation process to make syrup (Figure 14). An evaporation pan is designed so that sap is added to the pan at one end and syrup is removed at the other in a “continuous” process. Most hobbyists use a “batch” system, in which sap is placed in a single pan and heated. More sap is then added as water evaporates until a suitable amount of concentrated sap is present. The evaporation process is then continued with no additional sap and the entire batch is “finished” to the desired density. You may be contemplating boiling your sap on the kitchen stove. Keep in mind that you are boiling off a large amount of water to get to the syrup stage. That kind of steam in the house can have consequences. You can finish off a small amount in the kitchen, but it is not recommended for the entire process. You will need a heat source and a pan to boil on. Plan on boiling at least once a week. You may be forced to fire up more often if the flow is heavy. 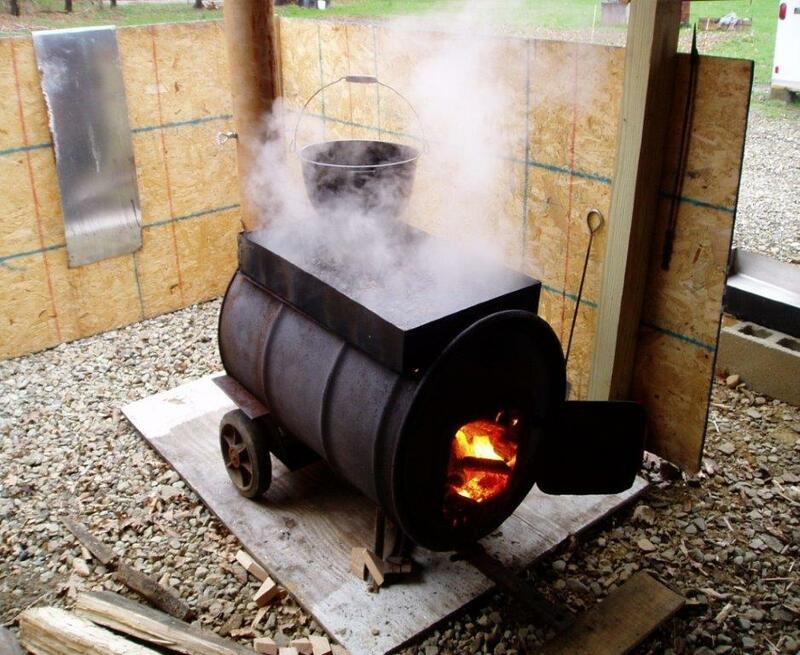 Many hobby producers start out with a turkey fryer fueled with propane gas, however be sure there is no oil residue left in the fryer. You can also build a fireplace out of block and put a pan over a wood fire. Barrel stoves (Figure 15) can be modified to support a pan for boiling. You will need an adequate supply of dry wood to boil syrup. Wet wood just extends the time required to complete the process. Rates of evaporation from a flat bottom pan are highly variable. Depending on many factors, including the size of the heat source and the type, size and construction of the pan, they may range from as little as ¾ to more than 1½ gallons of water for each square foot of liquid surface. A 12-inch square or 14 inch in diameter circular pan both have 1 square foot of liquid surface. Remember, 43 gallons of sap are required to produce 1 gallon of syrup—42 gallons of water must be evaporated. It will normally require somewhere between 28 and 56 hours of continuous boiling (and sap refilling) if a pan with 1 square foot of liquid surface is used. By comparison, a gallon of syrup can be produced in between nine and 18 hours using a rectangular 24 x 18 inch pan (3 square feet of liquid surface). Obviously, the larger the pan, the more quickly the evaporation process will be completed. Do not overfill the pan, as boiling sap usually rolls and foams. To avoid burning or scorching, monitor the heat carefully (do not let the heat get too high), and keep at least 1½ inches of liquid in the pan. The risk of scorching increases as the density of the liquid increases. with a preheating pan. Figure 16. Candy thermometer. 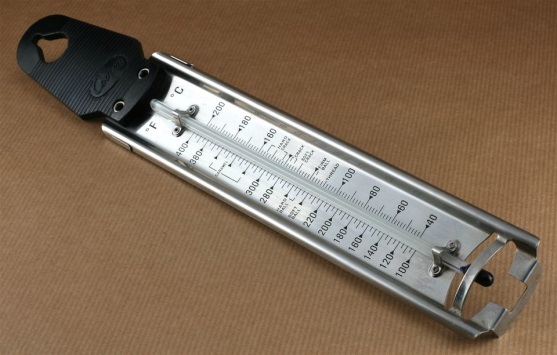 One essential tool you absolutely need to have is a candy thermometer (Figure 16). This will allow you to monitor the boiling point throughout the entire process of making syrup. Build your fire and bring the pan to boil. The thermometer should read 212 degrees Fahrenheit, the boiling point of water. Since the boiling point of water varies with location (elevation) and weather (barometric pressure), you should determine the boiling point of water before making syrup. This is easily done by placing your thermometer in a pan of boiling water and record the temperature reading. Once you have the liquid up to a boil, use your thermometer and get a reading. The thermometer may read 211 or 212.5 degrees Fahrenheit depending on the barometric pressure on any given day. Just remember, finished syrup always boils at 7 degrees Fahrenheit above the boiling temperature of water. The higher the sugar concentration in a sugar solution, the higher the temperature at which the solution boils. Once the liquid starts to condense, the thermometer reading will rise to 213, or 1 degree above the boiling point of water. You now need to add more sap. If possible, the sap you add should be preheated. 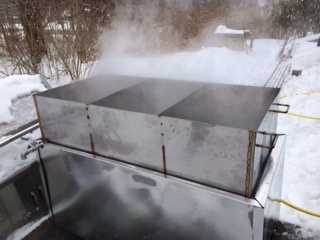 You can accomplish this by suspending a pan over the top of your operation, utilizing the steam to preheat your sap. Placing cold sap into a boiling pan will really kill the boil and slow the whole process down. You will have to experiment with the amount of sap you add, every setup is different. Continue this process until you have boiled all of your stored sap. After the last of the raw sap is in the pan, watch your temperature and the level of sap in the pan very carefully. Remember, you have syrup when the temperature rises 7 degrees above the boiling point of water. Trying to make syrup on the main pan outside can be very tricky. You never know exactly how much finished liquid you have. Be aware that once you go past 215 degrees Fahrenheit, things happen very quickly. You can go above 219 degrees Fahrenheit in a matter minutes. As the temperature rises above 219 degrees Fahrenheit, the risk of burning the pan increases. Assemble everything you need to quickly draw off the liquid when it is ready. Constantly check your temperature and your depth level. Once you have reached the desired temperature, reduce the heat to a simmer. Once the boil has slowed down to a simmer, draw off the liquid into a collecting pail or pot. Test the temperature of the liquid in the pail. It should be reading no more than 215 to 216 degrees Fahrenheit. Once empty, remove your syrup pan from the fire quickly. During this transition process, wear a good pair of gloves that protect your hands and lower arms, and a heavy apron to protect your body. Keep in mind, you are dealing with hot pans, hot liquid and a hot fire—all of the above can burn you very badly if you are not careful. Any time you boil syrup, it is a good idea to keep a couple of pails of water handy to douse the fire or to flood the pan if something goes wrong. At this point, your unfinished syrup can be transferred to a pan and finished quickly on the kitchen stove or on a small camp stove in the backyard. Finishing syrup at the correct temperature is critical to producing quality syrup that stores well. Be sure the temperature reaches the finish point. If you go beyond the finish temperature to more than 7.5 degrees above the temperature of boiling water, add a little more sap and bring the syrup to the correct finish point. Another useful tool is a hydrometer (Figure 17). This instrument is used to measure the density of syrup. There are two scales: one for hot syrup and one for cold. The hydrometer will suspend in a cup or pail of hot syrup. When the top line is even with syrup level in the cup of hot syrup (211 degrees Fahrenheit), it will be 66°Brix or 66 percent sugar. You must be at or over 211 degrees Fahrenheit to get an accurate reading. Legal syrup at 66°Brix is properly finished. You can also cold test your syrup at room temperature (70 degrees F). Figure 17. Reading a hydrometer. Once the syrup has reached the desired density, it is ready for filtering and packaging. 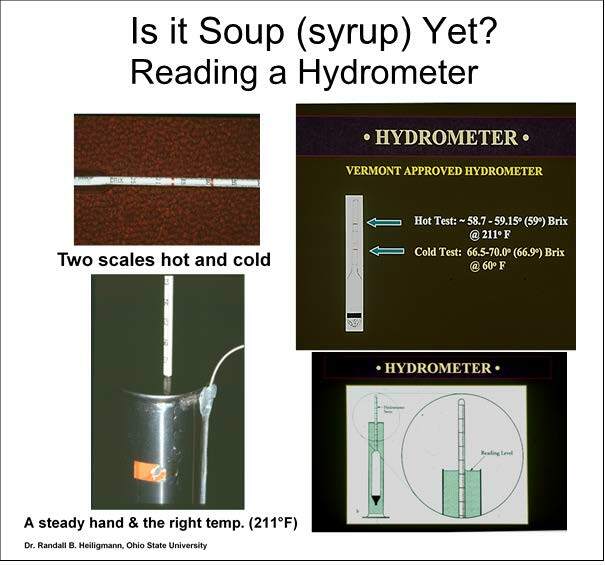 If you have a hydrometer, now is the time to check and verify the density of the syrup. The density can test between 66°Brix (66 percent solids) and 68°Brix. Less than 66°Brix and it is not legally maple syrup. It will be very thin, and it may spoil. Much higher than 68°Brix and sugar crystals are likely to form in the storage container. For instructions on the use of a hydrometer, consult the North American Maple Syrup Producers Manual referenced at the end of this fact sheet. Figure 18. Systems for filtering sap. Filter hot syrup through clean wool or synthetic syrup filters to remove sugar sand and other suspended solids (Figure 18). Never use cloths or towels washed in a detergent, as it will import an off flavor in the syrup. After filtering, syrup that is to be used immediately can be cooled and refrigerated. The rest of the syrup should be packaged hot in tightly sealed, clean, airtight containers. For safe storage, syrup temperature for packaging should be at least 180 degrees Fahrenheit and preferably 185 degrees F. After filling and sealing the containers, immediately invert them for a short time to flood the container neck and lid bottom with hot syrup. Hot packed maple syrup will store for months in an unopened container. Once opened, it should be refrigerated. Syrup can be stored for years in the freezer. There are a lot of steps to the process of making maple syrup, but don’t let that overwhelm you. Start with a tree or two to see how things go. It is always easier to grow your operation than to start too big, become overwhelmed, and just throw your hands up in defeat. 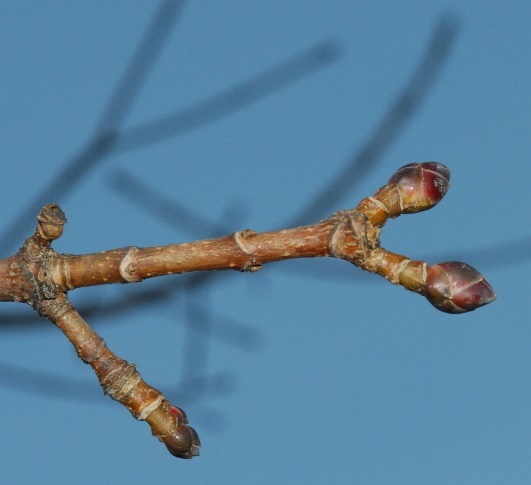 Tapping a few trees can be a great late winter, early spring endeavor for the family. Try it. The reward for your diligence can be something your family enjoys year-round. If you want to take your syrup to the next step and make confections, see the fact sheet “Maple Confections” or check out the North American Maple Syrup Producers Manual, available online here. Koelling, M.R., R.B. Heiligmann, T.D. Perkins. (2006) North American Maple Syrup Producers Manual. Columbus, OH: The Ohio State University.